Everytime I have to choose a new book I asked myself, what makes me enjoy a good thriller? A good group of characters. Fast pace, not long and boring chapters going nowhere. Chris Carter presents Robert Hunter in his first novel of this series. Robert Hunter is a complex individual, tough childhood, genius at school, bright mind, loneliness... ok, you have heard all of this before, but the serial killer he is fighting against got a brilliant twisted mind, who will put you at the edge of the bed every night wanting to finish the book. You want the baddie to be nailed ASAP. 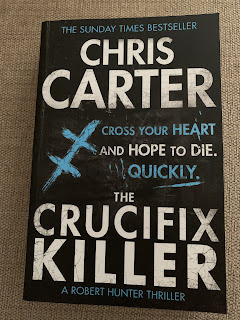 The different characters mixed well with the other small stories around the main storyline, making this thriller very enjoyable to read, and the action relates to a good box set of your favourite series more than a typical serial killer novel. I don’t particularly like the novels where the main character is so good, all generosity and white soul and the villain is so bad and mean. I prefer grey characters, people, good or bad, with a dark past, wit demons, insecurities. In other words, a character from the real world. This book delivers in that matter. When I bought this book, I have to say that I didn’t have much expectations, in fact I purchased it as a combo 3x2 (this was the third wheel) and I have to say, that ‘The Crucifix Killer’ was the best of the three and since that day I have read another three more books wit the adventures of Robert Hunter and Co and I’m delighted to have discovered it.